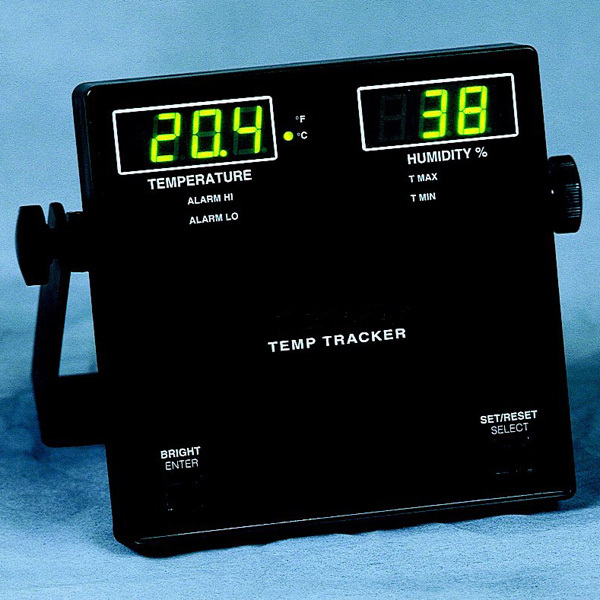 The 225-46203 Temp Tracker is a versatile temperature, dew point, and relative humidity indicator. Measured values are displayed on the front panel in large illuminated digits: temperature is shown on the left, relative humidity on the right. Maximum and minimum values are saved and can be viewed at any time. The Temp Tracker includes the following useful features: fully-programmable alarms for both channels, calibrated voltage outputs for connection to recording devices, and RS485 output for interfacing with serial devices. A front panel brightness control is also included. Input for the Temp Tracker is supplied by the 225-41382LC Relative Humidity & Temperature Probe which provides a convenient 4-20 mA current loop signal for each channel. For best accuracy, the probe should be housed in a protective shield. The 380-41002P Multi-Plate Radiation Shield provides excellent performance. The Temp Tracker is supplied with an adjustable bracket for wall or bench mounting. With the bracket removed the housing is sized to fit standard DIN panel configurations. The low profile design is easily installed on bulkheads or wall surfaces. DC power allows the Temp Tracker to be powered by external battery or AC wall adapter (115V adapter included, 230V optional).